Some Muslims including Autonomous Region in Muslim Mindanao (ARMM) Governor Mujiv Hataman had cried foul when Eat Bilaga hosts Senator Tito Sotto and Joey de Leon had appeared in the noontime show’s Halloween special wearing Muslim clothing last October 31. Hataman said that the hosts had displayed insensitivity by wearing the Muslim clothes as a costume. He also said that it seemed that the hosts are implying that the Muslims are to be feared such as the ghouls and zombies. 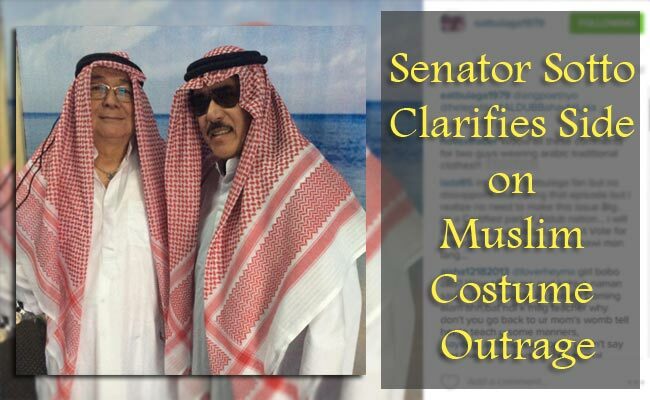 In a text message sent by Senato Sotto to GMA News, he shared that the costume was not depicting Muslims. It was an Arab costume and he had been wearing the costume in certain occasions. Furthermore, the law maker defended that some Arabs are also Christians and some people even wear costumes as nuns, priests and popes. However, for Hataman, it seems to be a mockery for the Muslim’s image just for entertainment and the hosts including the producers must apologize publicly. Even some Facebook users shared the same sentiment with Hataman. Facebook user named Hassan Al-Basri Dalanda commented that wearing such garb is inappropriate since the attire is not a Halloween costume. Hataman said that a public apology must be done as they must be reminded that Muslims are often discriminated against in the society and often they are stereotyped as terrorists and troublemakers. Even recently, National Bureau of Investigation as also criticized by many by making ‘Muslim type’ a description for the Zamboanga bombing suspect. On the other hand, Senator Sotto stood his ground that they had not intend to disrespect the beliefs and image of the Muslims. He had already used the Arab costume in the past in certain events and he had no intention to depict negativity in Muslims image.